Marty Sklar was hired by The Walt Disney Company after his junior year at UCLA, and began his Disney career at Disneyland in July 1955, the month before the park opened. He spent his first decade at Disney as "the kid," the very youngest of the creative team Walt had assembled at WED Enterprises. But despite his youth, his talents propelled him forward into substantial responsibility: he became Walt's speech writer, penned Walt's and Roy's messages in the company's annual report, composed most of the publicity and marketing materials for Disneyland, conceived presentations for the U.S. government, devised initiatives to obtain sponsors to enable new Disneyland developments, and wrote a twenty-four-minute film expressing Walt's philosophy for the Walt Disney World project and Epcot. He was Walt's literary right-hand man. 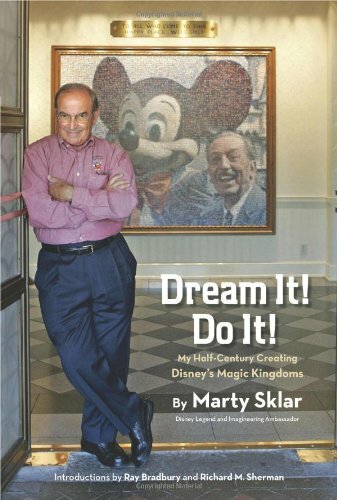 Over the next forty years, Marty Sklar rose to become president and principal creative executive of Walt Disney Imagineering, and he devoted his entire career to creating, enhancing, and expanding Walt's magical empire. This beautifully written and enlightening book is Marty's own retelling of his epic Disney journey, a grand adventure that lasted over half a century.